In 2013, the American Museum of Natural History and Yale University’s Institute for the Preservation of Cultural Heritage and the Peabody Museum of Natural History were awarded an Institute for Museum and Library Services‘ (IMLS) National Leadership Grant to fund a three-year project devoted to the development of best practices for recoloring faded mammal taxidermy mounts, especially those in habitat dioramas: Recoloring Faded Taxidermy: Research into the Properties and Applicability of Dye Materials for Conservation Treatment. After years of display under bright lights, and harsh temperatures and humidity, many taxidermy mounts have become discolored and faded. Techniques for restoring the lost colors of damaged natural history collections are limited and under-researched. This knowledge gap puts at risk collections of great educational value, especially as some historical specimens represent species that are endangered, if not already extinct. The project conservators are interested in developing re-coloring methods that would minimally alter the texture or sheen of hair and fur, and could be as reversible or re-treatable as possible. This research will foster cross-disciplinary partnerships between conservators and scientists with varying forms of expertise, helping to bridge the institutional gap between natural history, art, and history museums and collections. The IMLS-funded project will build upon promising results from a pilot study conducted by the Museum into the use of certain dyes, such as those used in certain specialized printing inks, to recolor taxidermy hair and fur. 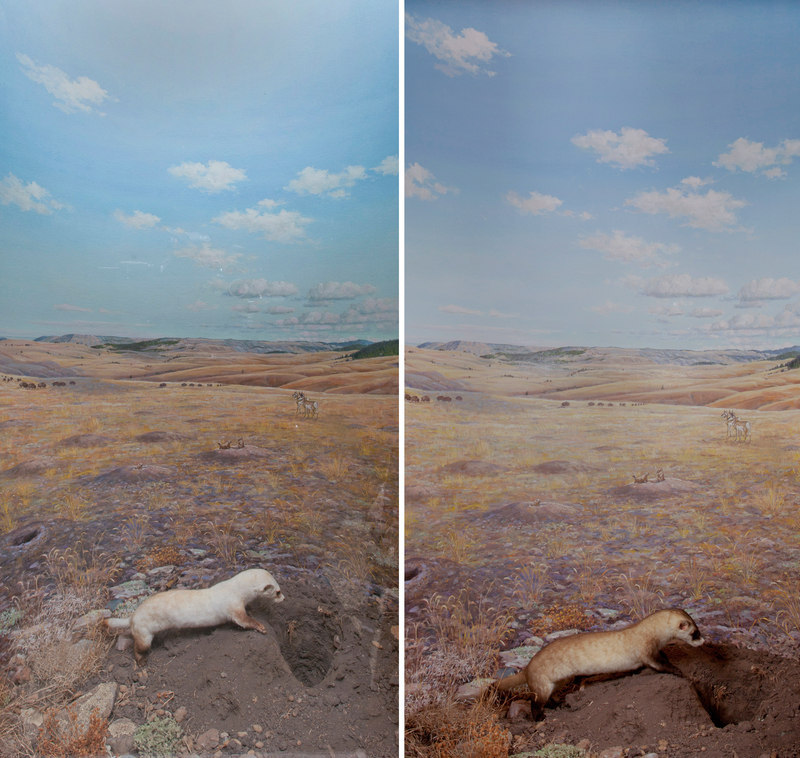 The next few posts will present the results of the restoration project that resulted in the dramatic restoration of the faded specimens in the habitat dioramas in the Museum’s Bernard Family Hall of North American Mammals. The findings from the study, which the Museum conservators presented at 2012 annual meetings of the Society for the Preservation of Natural History Collections (SPNHC) and the American Institute for Conservation (AIC) and published in the October 2012 International Committee of Museum, Natural History Collections Working Group Newsletter, were received with immense interest by practitioners and researchers alike. Together with results from a national survey among conservation professionals, it was evident that there was a strong need for comprehensive research to explore additional materials and discover an appropriate method for recoloring faded taxidermy in museum collections.